September 06, 2018 at 11:49 am. 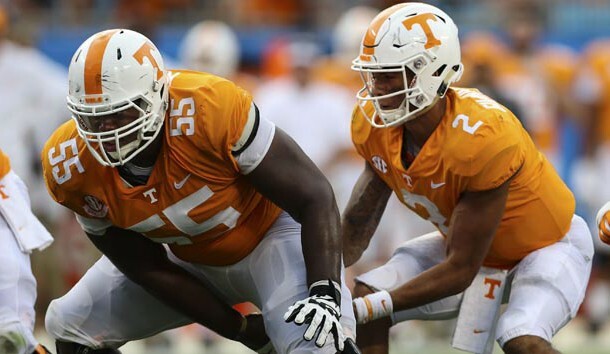 Tennessee starting center Brandon Kennedy sustained a torn ACL in his right knee and will miss the remainder of the season. This marks the second straight year of a season-ending injury for Kennedy, who transferred from Alabama. Kennedy was limited to three games with the Crimson Tide in 2017 before sustaining a season-ending foot injury. Kennedy will have another season of eligibility that he can use with the Volunteers for the 2019 season. The 6-foot-3, 301-pound Kennedy will also be able to appeal for a medical hardship waiver for this year and get back another season of eligibility in 2020. “We are going to worry about getting the proper medical care, getting him fixed and rehabbed,” Pruitt said. Sophomore Ryan Johnson, who started at right guard in the season-opening loss to West Virginia, is expected to shift to center Saturday against East Tennessee State. Guard Riley Locklear also took snaps at center during Wednesday’s practice for the Volunteers, who are coming off a 4-8 season in which they were winless in the Southeastern Conference.